From "A BLURFO Is Not A UFO"
There is a second class of BLURFO objects being tauted wide and far as everything from allien craft to ghostly entities. ORBS. Once again, we're dealing with an essential problem of optics. In the images below an experiment was conducted. White flour was placed on my right index finger. With a typical Olympus digital camera with flash, I took a series of rapid-fire photos while simultaneously blowing the flour from my finger out into the field of view. 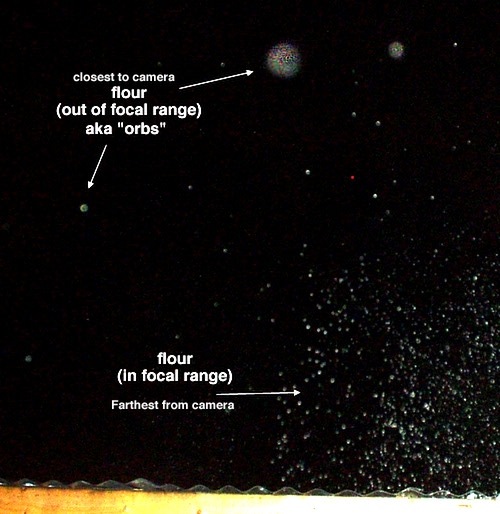 All of the specks of flour which fall in the BLURFO zone became classic "orbs." Distorted, over-blown, seemingly large, detailed, colorful spheres with the common Orb inner-ring signature. All specks of flour falling outside the BLURFO zone, where the camera could manage to focus, looks just like specks of flour. As they retreat further from the camera into darkness, they become less and less visible. 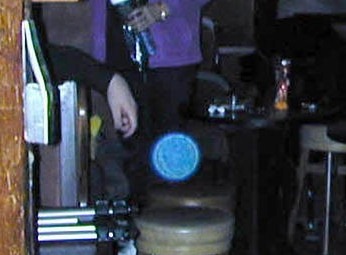 The BLURFO zone "orbs" are clearly distortions produced by a combination of the flash (which over-illuminates the flecks of flour) and the inability of the camera to focus on them in the BLURFO zone. 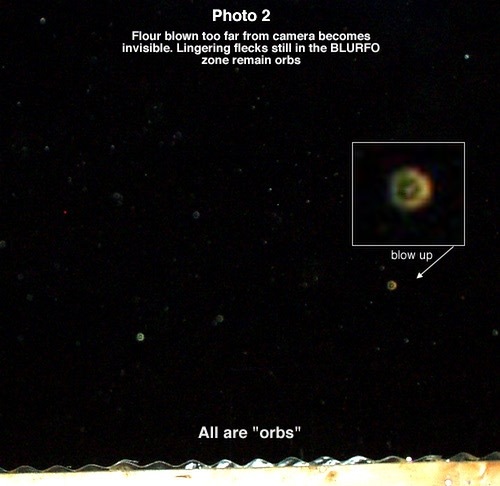 Saw the recent article by Neff on BLURFOs and orbs. 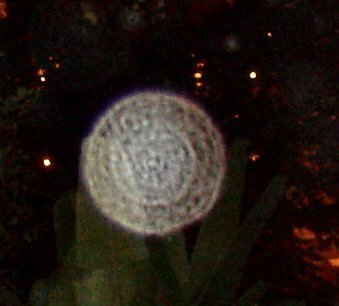 You might consider adding the following link to my research on "flash orbs". 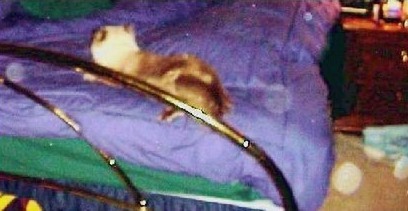 I have recently received emails from people claiming that such orbs are creatures from another dimension, etc. 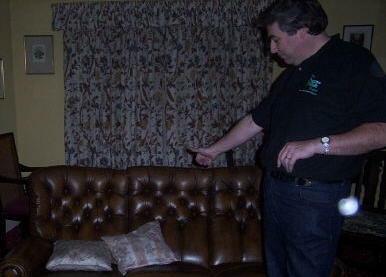 They claim to see faces in the orbs. I just turned away from my monitor and snapped a shot.